Kadode Kampot Pepper UK has been chosen as the winner of the inaugural Food Business Challenge. The national competition is designed to boost the growth of small business in the food and drink sector and was launched and supported by food and drink specialist Pelican Communications and led by its client Roythornes Solicitors. Kadode Kampot Pepper UK is the partner of Cambodian-based pepper producer, Farmlink Ltd and as the winner will receive over £5,000 of strategic advice and support from Pelican, Roythornes and the other challenge partners, business consultants WLP, accountants Bulley Davey and designers Childsdesign. The pepper company was chosen following a comprehensive analysis of the entries from each challenge partner. Michael Winters, director of Kadode Kampot Pepper UK, said: ‘We are absolutely thrilled to win the Food Business Challenge competition. ‘Winning the competition is a validation of both our products and company ethos. 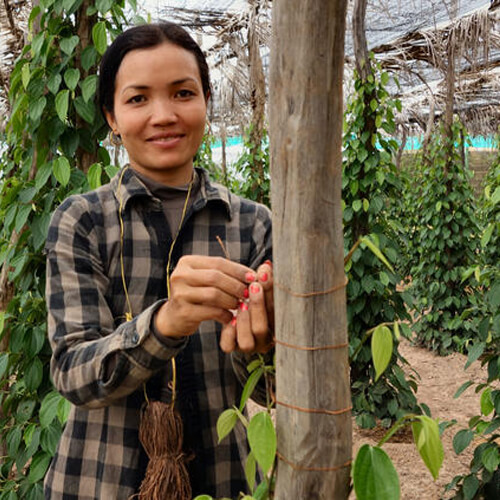 It makes the huge efforts expended by ourselves and our farming partners in Cambodia to ensure sustainable cultivation, production, and complete provenance of these amazing high quality peppercorns, feel fully worthwhile. Kadode’s peppercorns enjoy GI Protected status and are grown by over 140 independent farmers in Southern Cambodia under the Farmlink umbrella which ensures all cultivation, sorting, grading and cleaning is meticulously managed by hand using organic methods. The business recently announced that it has achieved a fantastic return from its entries into the Guild of Fine Food’s Great Taste Awards. It was awarded the highest accolade of three gold stars for its red peppercorns and gold star for both its black and white peppercorns. Childsdesign – Will audit the successful business’ packaging, identity and website and analyse how it fits with the companies’ brand values.